If you are missing one or even all of your teeth, and you want a stable, realistic restoration, consider dental implants from our Saratoga Springs, NY, practice. When you visit My Saratoga Dentist PLLC, you can receive complete implants treatment in one convenient location. Dr. Ryan Osinski can use his advanced training and experience to place your implants strategically, maximizing your jawbone for stronger support and easier recovery. When you have fully healed, he will provide your custom restoration, made from the latest restorative materials. Thanks to implants, you can enjoy a lifelike smile, renewed dental function, and improved oral health. Implants are tiny titanium posts that uphold custom restorations. Dr. Osinski can insert these posts directly into your jawbone, where they will integrate and replace lost tooth roots. 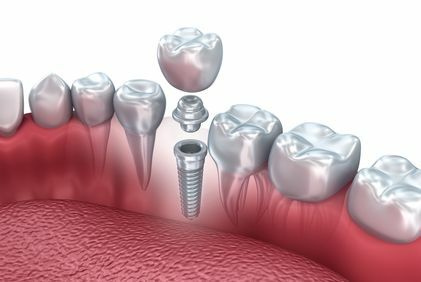 You may be a candidate for implants if you are missing one or more teeth. Because we provide lifelike implant-supported dentures, you can even receive implants if you do not have any remaining teeth. To qualify for treatment, your jawbone must be strong enough to support the posts. If your jaw has begun to shrink as a result of tooth loss, or your sinuses are too low, you may not be able to undergo successful treatment. Fortunately, Dr. Osinski also performs advanced surgical procedures such as bone grafting and sinus lifts. By rebuilding your jaw or gently raising sinuses, he can create a strong base for dental implants. He will take x-rays and digital scans of your jaw to determine your candidacy for treatment and to find out if you require bone grafting. Dr. Osinski graduated from the Misch International Implant Institute’s Surgical Program. He is also a fellow with the International Congress of Oral Implantologists. With his background, your surgery will be safe, efficient, and comfortable. Before implant surgery, we will administer anesthesia and sedation for your comfort. We offer several different options and will help you select the type most suited to your needs. Once you are comfortable, Dr. Osinski will make one or more small incisions in your gums. Through these incisions, he will fix the implant posts in your jaw. When the implants are in place, he will reposition your gums and use dissolvable sutures to close the incisions. After surgery, you will usually spend about four to six months healing. During this time, your jawbone will fuse around the implant posts to make them permanent fixtures in your jaw. You will spend the next four to six months healing as the posts fuse with your bone tissue. Once the implant posts are firmly rooted in your jaw, Dr. Osinski can attach your dental prosthetic. Implants can support several types of restorations, including crowns, bridges, and dentures. Dental implants offer many advantages over other restorative options. Most noticeably, implant-supported restorations are far more stable and secure. Your new teeth will not slip out of place. As a result, you can eat all of your favorite foods, speak clearly, and smile with confidence. In addition, your prosthetic can look very realistic. Not only will it be custom-created to match your natural teeth, but it will also sit right along your gum line. Implants are also very durable, and with proper care, can last the rest of your life. Additionally, implants have important health benefits. When performing implant surgery, Dr. Osinski will not need to alter your surrounding teeth. In contrast, when placing a traditional bridge, he would need to reshape the nearby healthy teeth so that they could uphold the restoration. Perhaps most important of all, by replacing your tooth roots, implants will prevent jawbone recession. The posts will send regenerative signals to your jaw, preventing bone loss, and preserving the shape of your facial features. Dental implants are able to provide superior support for restorations and preserve your oral health. To learn more about dental implants and to find out if you are a candidate for this treatment, contact My Saratoga Dentist today.